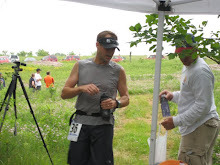 Ultra Quick Summary – 4:52 – 19th place overall. Extremely pleased with results. The weather called for possible showers, high in the mid 70’s, overcast sky for the morning. All played out, the race was humid and there were a couple of periods where it was sprinkling, but thankful the sun stayed behind the clouds for the majority of the race. You gotta like the race directors at ultras. They give new meaning to “laid back”. With that, and a “Hey Doug, good luck, we’ll see you at the finish line!” from John and Beth, I was off. The first few miles of any long race, I like to take it easy, get into a comfortable pace and actually enjoy where I’m at. This race was no exception; and a race such as this one reminds me why I started running in the first place, to be able to enjoy being outside. The hills came and went, both up and down, and I maintained a comfortable pace. I wasn’t paying much attention to the runners around me, and in a race through the trails with how crowded the first downhill was; it was amazing at how quickly the race field seemed to spread out. At mile 6, I noticed I was in a small group of about 4 runners. At that point in time, I decided I would stick with this group. They were in no particular order – “Leprechaun man” -red hair and beard, along with a green shirt; “Blue shirt guy who looks like Dave (from the Saturday morning running group)”, and “shirtless Michigan man” (due to the navy blue and gold shorts). Blue shirt guy who looks like Dave was out in front by about 50 meters, Leprechaun man, just behind him, then 25 meters in front of me was shirtless Michigan man. Since it was early in the race, at this point just under a marathon to go, I thought this group could set the pace for the next few miles so I’ll hop on the end as the caboose of the train, and let them pull me for a bit. Shirtless Michigan man didn’t want to play my game. I think he wanted to crush Leprechaun man and Blue shirt guy who looks like Dave. At about mile 7.5, He started to speed up, and I kept pace. This part of the race was one of two spots where the trail is pancake flat, and I thought I could handle going a bit faster. I felt like we were running pretty hard; I checked my reliable Garmin, and noticed I was running at a 7:10 pace – faster than race marathon pace??? - Probably not a good thing. It was time to let shirtless Michigan man go. I eased back to a 7:45 pace on the flat and had a feeling I would see him in a bit. Shirtless Michigan man went ahead of the other two runners and I stayed as the caboose behind Leprechaun man and Blue shirt guy who looks like Dave. The group, now with a new leader, headed up another long half mile hill at about the 8.5 mile mark. Leprechaun man and Blue shirt guy who looks like Dave slowed way down on the uphill. I walked past both on the uphill. However, on the downhill side just past mile 9, both came barreling past me almost out of control. We were then running pretty close, only a total of 10 meters between the three of us as shirtless Michigan man must have been way out ahead. Then I spotted shirtless Michigan man coming up on the side of the trail inspecting the bark of a tree. Oh wait, he was peeing. All of a sudden, all four of us were within 10 meters. We hit the second flat, this one about ¾ of a mile long, and shirtless Michigan man and I hit it hard again. We were pounding along at 7:30 pace and left Leprechaun man and blue shirt guy who looks like Dave behind. We were well ahead of the duo when we started up the hill named “Meat Grinder.” I did not see the Leprechaun man and blue shirt guy who looks like Dave again. I came alongside shirtless Michigan man after the uphill and through some rolling hills. Since I was passing some time and feeling good, I decided to initiate a conversation. “We are running at a pretty good clip, we should hit the half-way point around 2:20” I stated. “Aw, I’m just hoping to break 6 hours, if I run the first lap under 2 ½ hours, that gives me 3 ½ for the second loop.” Shirtless Michigan man replied with a condescending tone. “What – you don’t believe in negative splits?” I asked jokingly. “I did when I did my Ironman last year”. Okay, for the record, there are two types of Ironman out there, the first I typically don’t get along with and the second are some of my best running mentors. First, from my experience, most are “Type A” personalities, who have an ego the size of Godzilla. The second type is the good guys, who I respect for their knowledge and wisdom of endurance races. (If you are an Ironman and reading this, you know which one you are.) This guy went immediately into the first type. “Arizona” was his one word response. We then ran without an exchange of words and I decided it was time to cut the rope. At mile 12, just before the aid station, I left him behind on an incline. I was truly afraid this man was going to tackle me from the back, so after the aid station, I headed into the single track prairie and woods with some extra hop in my stride. The single track trail through the prairie and woods was extremely tight. I think the path to run on was about 18 inches wide at best. The prairie grass came up to the middle of my mid-section. Remembering back to the race director’s comment at the beginning of the race, I thought, why yes, the single track is overgrown. This part of the race made me dizzy. I was trying to stay on the path, watching the footing in front of me, hoping that “Arizona-Wisconsin-Michigan shirtless man with extra ego” would not catch me. I was running hard although my splits didn’t reflect it. This was a pretty technical part of the trail, lots of short ups and downs, large rocks, and the winding trail. I emerged pretty much in tact as I came upon the end of the first loop – no where in sight was extra ego man (I never saw him again). My brother was at the drop bag location to help me out. I refilled and refueled with some Cliff Shot blocks, water, and pretzels. My watch was at 2:22, and the official clock was around 2:24. I had a couple minutes worth of aid station stops and some slow up hills that my trusty Garmin must have went into “auto pause” mode. For a moment, I actually believed my brother and though I was doing okay. However, thinking back to the first loop, I knew I went fast on the flats and was afraid it was going to cost me on the second loop. At best, I was hoping to match my first loop time. The next 11 miles seemed to be uneventful. I occasionally peeked over my shoulder to make sure extra ego man wasn’t there, but there was no one around. I remembered another item the race director mentioned, “keep the flags to your left or you’ll get lost” I just kept the flags to my left and ran when I could. I managed to pass three people in this long 11 mile stretch. No one caught me from behind. The down hills began to take their toll on my quads. I ran them fast, and knew I was going to feel it over the next couple of days. Other than my quads, I was actually feeling pretty good. I ran the flats fast again and found myself in good shape for the last 6-7 miles. At mile 27, I spotted a couple of runners ahead of me. I quickened my pace as I thought my chances of getting in the top 20 just improved. I flew by two older ladies still working their way to finish the 25K that started an hour after the 50k start. My bubble burst. Oh well. I started to pass many of the walkers still hoping to complete the 25k. I had a good idea that most were in the 25k race, but I was still hoping to see someone from the 50k. I then saw a blue sleeveless shirt guy ahead of me; he disappeared around a corner in the trail. I passed a couple more 25k walkers and thought for sure that I must be catching this guy. I then looked up one of the days many steep hills. I was headed up a big incline and the guy was less than 50 meters in front of me! However, he was running up the hill and I was walking. With still about 4 miles to go, I couldn’t spend the energy to catch him on the uphill, so I walked. As I walked up the hill, I noticed I was still catching the blue shirt. He was running up the hill slower than I was walking it. At that point, I knew it was just a matter of time until I passed him. When I passed him, I thought he was going pretty slow, maybe a fit guy doing the 25k at a slow pace. I was mad as I thought that I just caught another 25k walker. I stated a friendly “Keep it up, just under 4 miles to go!” runner to runner acknowledgement; he replied back with a “Just under a mile to the aid station at mile 28.” At that point I realized he was in the 50k and I just moved up to spot 20. With less than 3 miles to go, I started to pick up the pace. The 25k walkers were kind enough to do their best of moving to the side of the trail as I ran by them. It was a great feeling to be going so fast compared to the walkers. Any small victory, I’ll take. I was beginning to just hope to hold onto my place when I saw a redshirt in front of me at mile 30. I can still get him. I must be part bull, when I saw red I hit it hard. With about a half mile to go, I passed the guy. There was no way he was keeping up. I felt bad for a moment, he ran a great race up to that point and I almost considered just running in with him. Nope, the bull won out in me and I passed him. A friendly “we are very close, good job, and keep it up” from me and a “great race” reply back was all that said. I ran to the finish line and came in at an unofficial 19th place somewhere around 4:52. About a half hour better than last year - I’ll take it!! *Actual Running time was 4:47:24 on the Garmin. Difference in time was due to some slow uphill walking and stops at aid stations for water, cookies, pretzels, strawberries, bananas and other food items (it was like a great snack buffet! ).